Someone asked the other day: “If you had to choose one issue that fundamentally differentiates Germany from Britain, what would it be?” This is a tough question to answer since the response depends directly on what the individual considers to be important and we all prioritise things differently. For me, the single most important thing, regardless of country and its level of development, is the extent to which our essential human needs are fulfilled or not. The definitions vary but the three immediate “basic needs” have traditionally been food (and water), clothing and shelter, followed by sanitation, education and healthcare. In the sense of fulfilling our basic needs, the key difference between Britain and Germany for me personally, is the issue of shelter or housing. The economic, social and cultural right to adequate housing and shelter is recognised in many national constitutions, the UN’s Universal Declaration of Human Rights and the International Covenant on Economic, Social and Cultural Rights. But this right is not simply about having a roof over one´s head, it is also a matter of whether it is affordable to households with different levels of income, as well as whether people are able to enjoy security of tenure (without fear of unreasonable eviction, rent hikes, etc. ), which is fundamental to our quality of life. To my mind, Germany broadly fulfils the right to housing, as well as affordability and security of tenure. But it is far from clear that Britain does; indeed according to some indicators, the housing market may even be moving backwards. This blog post sets the broad nature of the housing systems in Britain and Germany, with reference to the European Union (EU) context. The analysis below covers the issue of tenure, dwelling type, size and quality, dwelling construction (supply), adult population (demand), price and affordability. It demonstrates that the housing systems in Britain and Germany are fundamentally different in some ways, yet remarkably similar in others. Housing tenure basically refers to the legal rights of different forms of housing ownership and occupancy. The first distinction to note is owning and renting; whereas the owner buys a property (new or existing), the renter makes a regular payment to the owner for the right to live in a property. If the rent is paid to a private individual / institution, this is private renting. If the rent is paid to a local authority, housing association or cooperative, it is known as social renting. Table 1 illustrates the tenure differences between Britain and Germany. The key difference is that whereas Britain is primarily a nation of homeowners (70%), Germany is a nation of renters (55%) and has one of the lowest proportions of owner occupiers in Europe. These rather dated statistics reflect the fact that housing tenure is not collected on a like-for-like basis across countries. A notable feature of the British housing system is the recent decline of owner occupation in favour of private renting. To counteract this issue and to include the EU dimension, I Table 2 presents Eurostat data with a focus on population by tenure status. On this basis, by 2013 Germany had also become a nation of owner occupiers (52,6%) but renting remained equally important (47,4%) in terms of population. The respective figures in the UK are 64.6% and 35.4%, highlighting the fact that the level of private renting has experienced a revival in recent years, partly as a result of government policy. 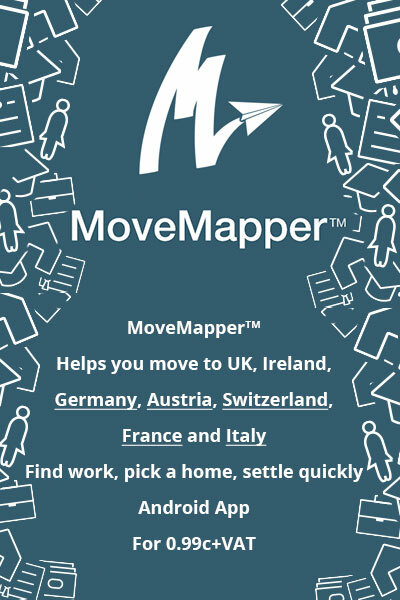 In the EU-28 countries, the situation is much closer to Britain than to Germany (70% and 30% respectively). .
Major tenure differences exist in Britain and Germany but the variance is even more pronounced when it comes to type of dwelling that people actually live in. Britain is very much a nation of house dwellers, with 84,8% living in detached or semi-detached homes. By contrast, Germany is even more a nation of flat/apartment dwellers (53,2%) than in the EU-28 (41,6%) as a whole. Britons obviously love their houses and gardens but I am not sure if the rest of the EU loves flats, even if a large proportion of the population in Europe certainly lives in one. An important aspect of quality of life is not only having a roof over one´s head, but the quality of the housing conditions that people live in. The overcrowding rate (% of people living in an overcrowded dwelling) in the EU-28 was a remarkably high 17.2% in 2012. The figure was much lower in UK (7%) and Germany (6,6%) according to the Housing Statistics Year Book (2014). The situation in the two countries is remarkably similar but 6-7% of people living in overcrowded dwellings is still a relatively high figure. The severe housing deprivation rate is defined as the proportion of persons living in a dwelling which is considered as being overcrowded, while having at the same time at least one of the following housing deprivation measures: lack of a bath or a toilet, a leaking roof in the dwelling or a dwelling considered as being too dark. Across the EU-28 as a whole, 5.1 % of the population experienced severe housing deprivation in 2012. The equivalent percentage was much lower in the UK (2%) and Germany (1,9%). Within the population at risk of poverty (households with a disposable income per person below 60% of the national median), the overcrowding rate was 29.4% in the EU-28, but the figure was much lower in the UK (13,6%) and Germany (17,6%). Poverty and poor housing conditions go together to large extent. When it comes to dwelling size, unfortunately the UK data are not comparable with other countries. The average dwelling is almost 107 m² in size in Germany, compared with 102 m² in the EU-28. Space standards are significantly more generous in dwellings that are owned than those that are rented in both Germany and the EU. The private rented sector has the lowers dwelling size of all. Broadly the same trends are likely to apply in the UK. For example, the English Housing Survey Housing stock report found that. “The average useable floor area of dwellings in England was 91 m². However some 52% of social sector bungalows, 50% of social sector flats and 35% of private rented flats had a total floor area of less than 50 m²” (2008, p.8). The indications are not only that the average dwelling size is smaller in the UK than in Germany and the EU-28. There is evidence that the average new average new home in the UK is actually getting smaller over time (76 m²). Elsewhere, the average size of new homes is increasing. House developments are influenced by many factors but a strong relationship exists between house prices and other indicators of demand and supply. Specifically in terms of supply, housing construction (i.e. building permits issued and housing units completed) is related to house price developments. If supply is out of kilter with demand, it may not matter too much in the short-term, but over a period of decades it can lead to acute housing stress and eventually crisis. The trend in terms of supply of housing in Britain and Germany is illustrated below. 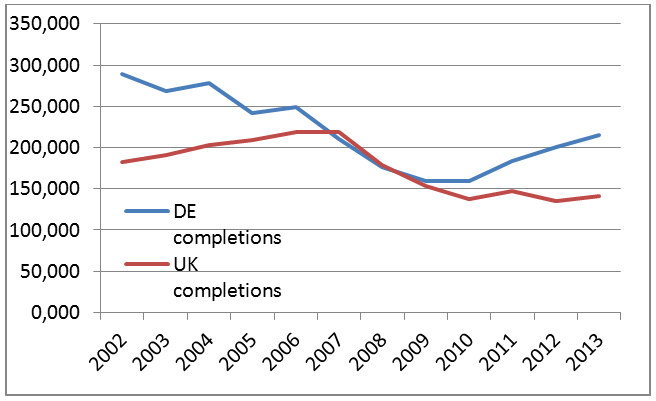 Graph 1 illustrates that Germany has outperformed Britain in terms of new supply of housing during the last decade or so. As demand for housing increased post-2008, there is evidence of supply responding accordingly. The German government forecasts 270,000 residential completions in 2015, the highest number of completions in over a decade, and argues that construction has reached the amount needed to keep up with future demand. By contrast, in Britain a country which is acknowledged by all and sundry to be in the depths of a full-blown housing crisis, supply has flat-lined around 140,000 completions per annum and government forecasts 135,000 completions in 2015. This suggests that housing supply is significantly more responsive in Germany than in Britain, despite not actually experiencing a housing crisis. The reasons for this critical difference will be explored in future blog posts. Another way to examine the situation is to examine the changes in adult population (over 18 years of age) and the extent to which the total dwelling stock is keeping up with the changing demand. During the period 2002-2013, the adult population in Germany increased by 1.8 million. During the same period, the dwelling stock increased by over 2 million units. By contrast, whereas the adult population in Britain increased by 4.4 million, the dwelling stock only increased by 2.1 million units (see Hypostat 2014, 26 Population 18 years of age and over). I shall explore other indicators of demand in future posts to illustrate the point that supply is lagging behind demand and has done so for decades in Britain. The OECD’s real house price index for the period 1970 (2nd quarter) to 2013 (4th quarter) reveals fascinating trends, as illustrated in the graph below. What the real House Price Index shows is that British house prices have historically been significantly lower than the German ones. But whereas the prices declined gradually from 1994 onwards in Germany, the UK experienced rapid price increases (with some volatility, especially during 1989-1992) until the end of 2007, when the global economic and financial crises hit. Thereafter, German house prices flat-lined for a while, but increased rapidly from 2010 – 2013, a trends that continues today. By contrast the UK prices experienced a steep decline in 2008, followed by a gradual increase from the end of 2013 onwards, a trend which has more or less continued to today. Rising since the 1970s, the UK house prices eventually surpassed those of Germany for a five-year period (2005 and 2010) but a gap is evident once more. For Germany, the real house price index remained more or less the same in 1970 as in 2013, suggesting a fairly stable housing market. The trends in house prices in the two countries are ultimately a reflection of demand and supply issues. Since supply is highly restricted in the UK for various reasons to be discussed in a future blog post, the trend of house price increases is almost certain to continue, especially in London and the South East region. It is only a matter of time until the UK house price index outstrips that of Germany once again. Housing affordability is a fundamental issue. Countries have broadly the same definition for this, namely that affordable housing should address the housing needs of the lower or middle-income households. The level of disposable household income is a key factor in determining affordability and it is ultimately the responsibility of governments to create the framework conditions for the delivery of affordable housing. Eurostat defines the proportion of the population living in households that spent more than 40% of their disposable income on housing as the housing cost overburden rate. Table 5 illustrates the situation in German, UK and EU-28 countries. Source: Eurostat Housing cost overburden rate (ilc_lvho07a). Data from 2011 used because there was a break in the UK time series in 2012. As a general rule, a significantly higher proportion of the population in the rented sector experience affordability problems than in the owner sector. Furthermore, the problem is particularly important in the private renting sector (market rents) and is especially acute in Britain, where 40% of the population in the private renting sector experiences a housing cost overburden. Overall, although the housing cost overburden rate is higher in Britain than in the EU-28 countries, the rate is higher still in Germany in the two owner categories. However, the housing cost overburden rate in the private and public rented categories are significantly higher in Britain than elsewhere. The housing cost overburden rate also varies between different groups of society. Generally, women are more vulnerable to housing cost overburden than men and, in some countries, the elderly tend to experience it more than the younger age groups. But the housing cost overburden rate says nothing about the extent to which people can afford to get a foot on the property ladder or rent privately. If people cannot do so, they have little alternative but to live with parents, friends, etc. in order to meet their housing needs. 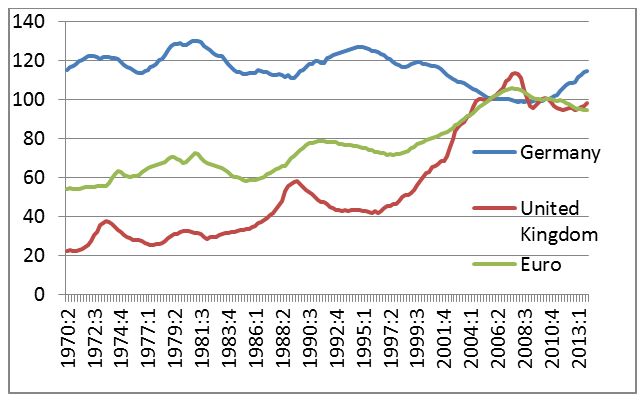 Based on the analysis above, the tenure pattern in Britain and Germany is very different in some ways: there are many more owner occupiers, people living in houses rather than flats, the dwellings are smaller and getting smaller over time and there is noticeably less responsiveness in the supply of housing in the UK than in Germany. On the other hand, the two housing markets converge in other respects: general overcrowding rate, overcrowding rate within the population at risk of poverty, severe housing deprivation rate, etc. are remarkably similar. Other indicators are mixed: house prices suggest a fairly stable German housing market but a somewhat volatile British housing market which is likely to exceed the German prices. The owner sector seems to exhibit more housing affordability issues in Germany, yet affordability concerns are much more acute in the British rented sector, especially in the case of private renting. The temptation may be to conclude that the differences in the two countries are not that great: wrong and double wrong! We all know the quotation: “There three kinds of lies: lies, damned lies and statistics”. Statistics are one thing but the housing reality is quite another. In the course of the next few blog posts, I intend to elucidate my starting point, namely that if I had to choose one thing that fundamentally differentiates Germany from Britain, it would be its housing system.